Booth 225! Come see us!!!!! June and July has been crazy busy at the day job. Not much to report except that we bought a car. I restarted my quilting project using the fabric scraps from my studio. Also, last Friday I took a sunny bike ride over to CraftyPlanet and bought these lovely fabrics. 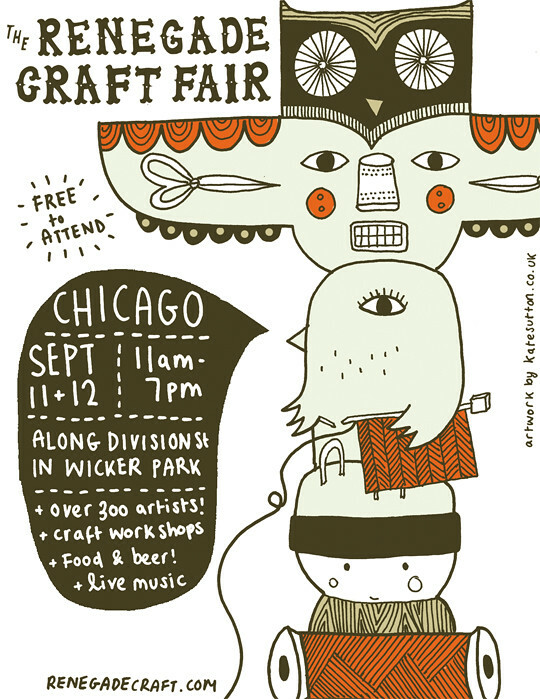 The super awesome news is that we got into Renegade Craft Fair in Chicago this year on September 11 + 12. Last year, we skipped because it was on the same weekend as our wedding. I’ve already started production on my items for the fair. Hopefully, this will help with the stress that usually sets in the week of the fair. Sunday Dinner before going home. Chris and I had quite a rainy adventure in Chicago 2 weeks ago for the Renegade Craft fair. On Saturday, we had a bit of a rough start. Unloading the car and setting up our tent in the pouring rain was not fun. And then, we ended up having to pack up and leave early due to a leaky tent in the early afternoon. I was really sad 🙁 We spent the rest of the day drying up and watching Battlestar Galactica with my sister. On Sunday, we came back with reinforcements (yay! shower curtains!!) and things got much better. Friends and customers drop by to say hi and shop. It was wonderful to see a lot of dedicated Renegade Craft shoppers at the show even though there was record breaking rain that weekend. Everyone in their wellies and their cute umbrellas.